The child is JetBlue's "youngest customer to date"
NBC 6 exclusively obtained footage of a baby being born aboard a JetBlue flight from Puerto Rico to Ft. Lauderdale. A baby was born aboard a JetBlue airplane named "Born to be Blue" in a flight to Fort Lauderdale. In a statement, JetBlue said Friday's Flight 1954 from San Juan, Puerto Rico, to Fort Lauderdale was met by medical personnel "following the onboard delivery of our youngest customer to date." "We’d like to thank the crew and medical professionals on board for their quick action under pressure, and wish the new mother and son all the best. Flight 1954 was operated on aircraft N523JB, coincidentally named, 'Born To Be Blue,'" JetBlue's corporate communications manager Jennifer Dang told NBC 6 in a statement on Saturday. 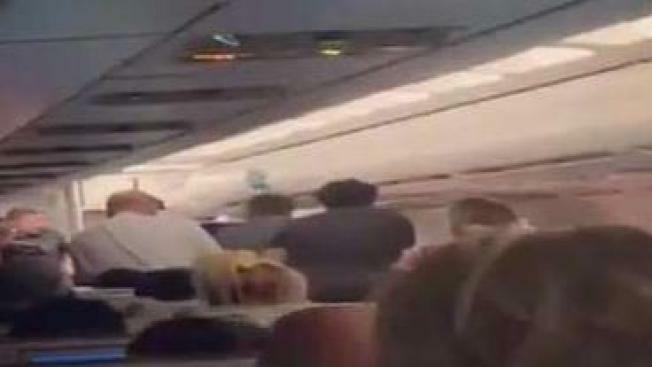 Video aboard the plane obtained by NBC 6 partly shows medical personnel treating the woman as lively chatting occurs inside the plane. JetBlue on Twitter said it wants to rename "Born to Be Blue" after the child. "Giving storks a day off. With mom’s okay, we’d like to rename 'Born To Be Blue' after our newest baby blue and our youngest customer ever. More baby shower gifts to come! #AirBorn," JetBlue wrote.